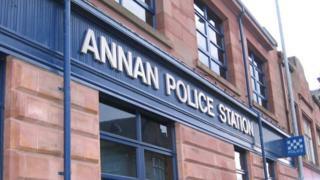 A 16-year-old boy has suffered serious facial injuries in a "vicious and prolonged" attack in Annan. It happened in a car parking area at Eden Place, near Springbells Road, between 19:00 and 20:00 on Saturday. The teenager was approached by a group of four young men and one of them assaulted him before they all made off. The victim required treatment in Dumfries and Galloway Royal Infirmary after the incident. Police have appealed for witnesses. Det Con Gary Story said: "We have been carrying out door-to-door inquiries in the area to establish if anyone might have witnessed this assault. "I would appeal to the community to come forward if they have any information which would help us catch those responsible. "At this time the description we have of the attacker is that he was about 17 to 18 years old, slightly taller than 5ft 8in, wearing a North Face zipped hooded top, with the hood up, and dark jogging bottoms and training shoes."